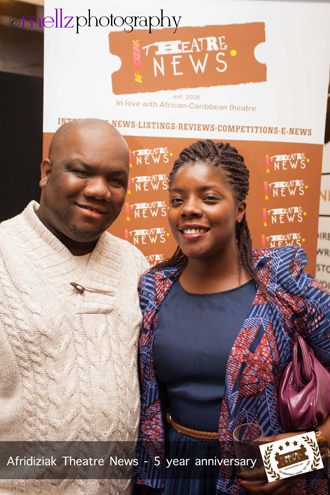 On Friday, September 27 at Talawa Studios Sophia A Jackson hosted an event to celebrate five years of her site Afridiziak Theatre News – the UK’s only website dedicated to African-Caribbean theatre. The invite-only celebration was attended by theatre industry professionals, media, family, friends and supporters of the site. 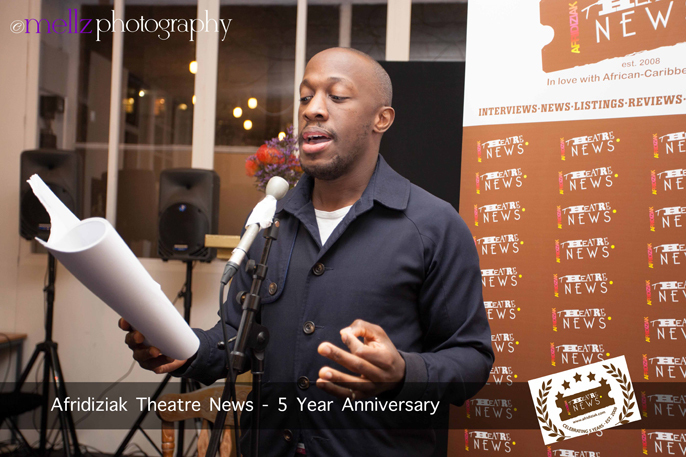 Sophia A Jackson, founder/editor, Afridiziak Theatre, said: “Thank you to everyone who joined me in celebrating five years of Afridiziak Theatre News. It was a truly magical evening and I am blessed to have such wonderful people in my life. Thank you to all the reviewers, advertisers, everyone in the industry, general supporters and my loved ones who have shared this journey with me. Here’s to another five years and more”. Guests were entertained and energised by master African drummer Alex Dayo. To close the event Giles Terera (starring in The Book of Mormon) rushed back from the premiere of his documentary Muse of Fire at the Raindance Film Festival, to move the intimate gathering with a recital of his poem I’ll Walk With You. The poem was first read at the National Theatre as part of the Walk in the Light series of events celebrating 50 years of black theatre in July and can be read in full. On the night, during her speech, Sophia A Jackson took the opportunity to publicly acknowledge her brother Basil Lumsden, who is the web developer and designer for Afridiziak Theatre News and Gillian Fisher, the site’s reporter for their passion and dedication to the site. Courtesy of Talawa Studios, attendees took advantage of the theatre company’s props, wigs and costumes and nurtured their inner thespian. As guests mingled and networked, the well-attended event was captured by Mellz Photography with catering from Maurice Charles and cupcakes and surprise mini desserts by Dinah’s Desserts. 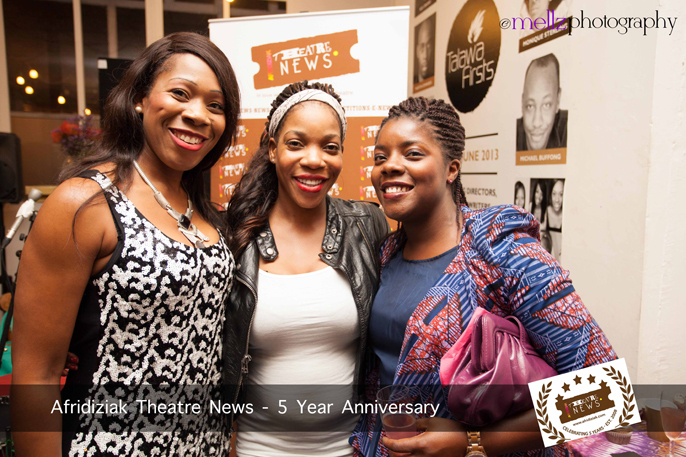 Juanita Solade Rosenior, MD, Afrobase said: “Happy 5th Birthday to Afridiziak Theatre News. Sophia, your perseverance and dedication is inspirational. Thank you for all the support you've shown and continued blessings to you always”. This has been an amazing week for Afridiziak Theatre News with the announcement that Sophia A Jackson has been shortlisted for this year’s Precious Award for ‘Woman in the Media’. 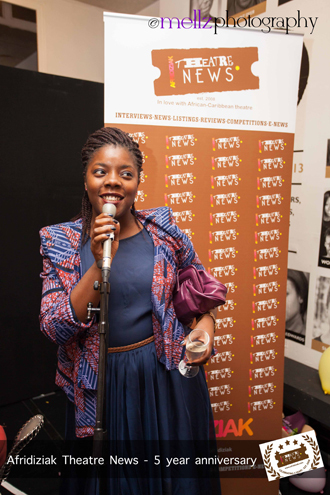 Sophia A Jackson is the founder/editor of Afridiziak Theatre News which was established in September 2008. Sophia is available for interview - sophia@afridiziak.com / 07855 86 77 78. Images from the event are available upon request: sophia@afridiziak.com.